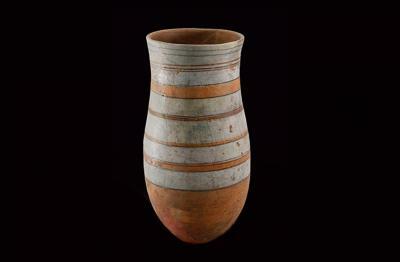 It was in the production of stone cups where the ancient Egyptians learned and practised the techniques that would enable them to create large sculptures and architectural works. 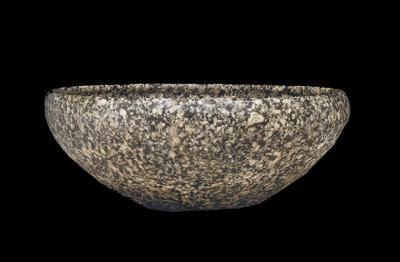 The Egyptians made tableware mainly from mud, stone and metal. The tableware embodies a very wide range of forms and functions, and was used in contexts relating to everyday life and funerals. 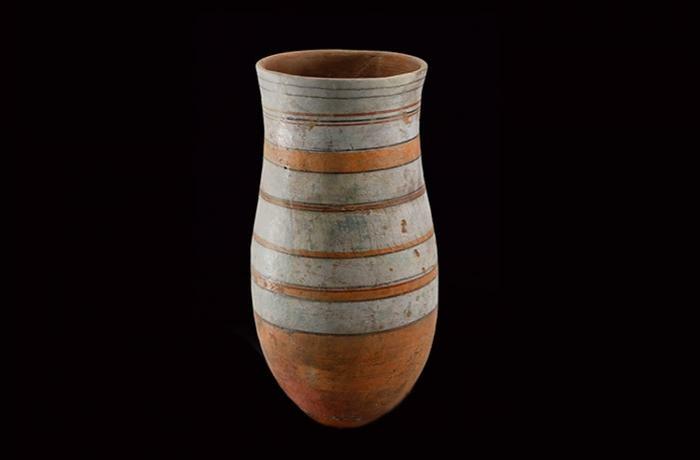 During the pre-Dynastic Period, the processing of stone and ceramics reached such a high technical and aesthetic level that it would be barely surpassed during the pharaonic period. In general, it can be said that stone products feature as deluxe tableware par excellence, relegating ceramics to a secondary role. These creations were made in all types of stone (in particular harder types of stone), in which the Egyptians learned and practised techniques that they would apply on a large scale and with a unique mastery to their sculptures and architectural works. Storage pitcher. 18th Dynasty, circa 1350 B.C. Painted earthenware. Oven-fired ceramic pitcher. Outer surface painted with stripes of different colours, separated by yellow and black lines. Tombs could also contain elements necessary for subsistence. Food was usually placed in receptacles made from stone or earthenware, or in baskets or boxes. In the tomb of Tutankhamen there is a pitcher that is virtually identical to this one. Bowl. Granodiorite. 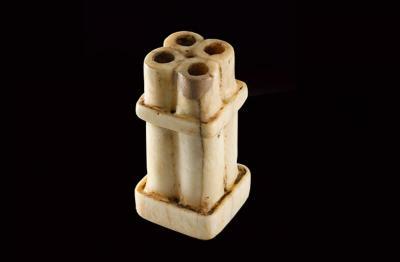 1st-3rd Dynasties (2920-2575 B.C.). Glass for cosmetics. Alabaster. The New Kingdom, 18th Dynasty (1550-1307 B.C.). Alabaster, a relatively soft material and therefore easy to fashion, was the most widely-used raw material used in the production of stone tableware from the Ancient Kingdom onwards.